You could spend your whole day at eM gazing at the tranquil Singapore River. From morning till late, eM caters your every craving needs. 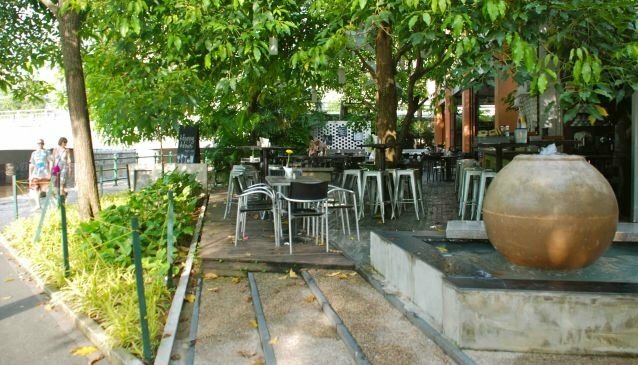 Serving all day breakfast daily, eM by the River is one of the Gallery Hotel restaurants and is positioned at one end of Robertson Quay below Saiboo Street Bridge. The brunch menu has all the standard favourites, including poached eggs on English muffin with ham and hollandaise sauce, Eggs benedict, the American breakfast and other classics. For lunch eM serves some favourite European dishes such as pastas, salads, sandwiches, and the delicious Croque-Monsieur and Croque-Madame which is only available from 11am. For dinner, some other appetizing quick bites are available including the Smoked Salmon Bruschetta and some homemade beef burgers. The ambience at eM is very pretty, nestled by the river under romantic trees beautifully lit up at night for guests to sip a cooling cocktail.